* The Avanti Van Dyck Easel is the ultimate table top easel. 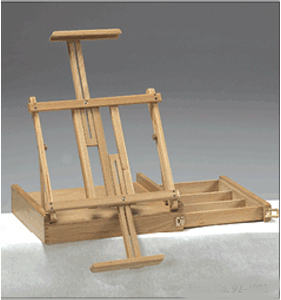 * The easel itself is constructed of seasoned elm wood with a hand rubbed linen oil finish. * The upper and lower canvas supports are both adjustable, wherein the lower canvas support will actually allow one to position the canvas below the table top surface. * This is an extremely convenient feature for positioning one's artwork in progress. * Unlike most easels, the compartmentalized drawer in this case opens to the side. * This allows for the drawer to be open even while working. * This deluxe version was designed for all mediums and folds flat, locks into place and may be easily transported or stored. * Maximum canvas height: 34 3/4"